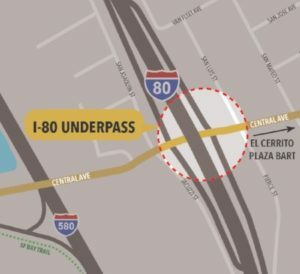 Do you bike or walk on Central Avenue under I-80 to reach the places you enjoy? Would you like to help make it easier and safer to do so? The Central Avenue / Interstate 80 (I-80) underpass in Richmond leads to a lot of great places—the San Francisco Bay Trail, Point Isabel Dog Park, Costco and the Richmond Marina, to name a few. 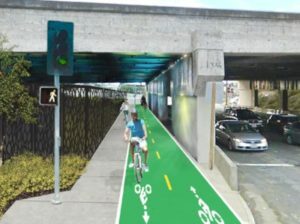 CalTrans District 4 wants your ideas on how to transform the underpass into a high-quality pedestrian and bicycle connection! 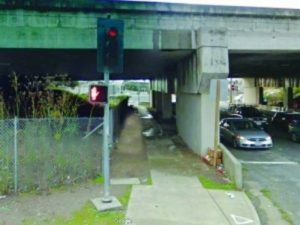 Help improve your biking and walking experience in the East Bay! Join us at the Community Workshop to share ideas on the project design. We will discuss safety features, lighting, wayfinding and other design elements. It could look like this!! You! Residents, cyclists and walkers in Richmond, El Cerrito, Albany (Pierce Street and West Albany residents, that means you!!) and beyond.